Here is a portrait of an Amish girl with a rabbit titled, “Katie With A Bunny” . I wanted her to look like she was very serene and peaceful and above all, caring. The rabbit here was to add that quality and also to add extra softness to the picture. I hope you like it. This colored pencil drawing was done awhile ago. I figured since it mentioned four-leaf clovers in it and St. Patrick’s Day was Saturday, why not post this. Makes me kind of realize I should do more St. Patrick’s drawings! You think I would have more for this special day since my maiden name was Riley and my married name is McNulty!!!!! Anyway, here is one for friends -and for St. Patrick’s Day! Here is another popular reblog. I feel it is appropriate right now because of Halloween approaching and the whole cemetery thing. I hope you enjoy this. It really makes you think. The view from my second – story bedroom window is a humbling one. It reminds me how precious life is everyday. 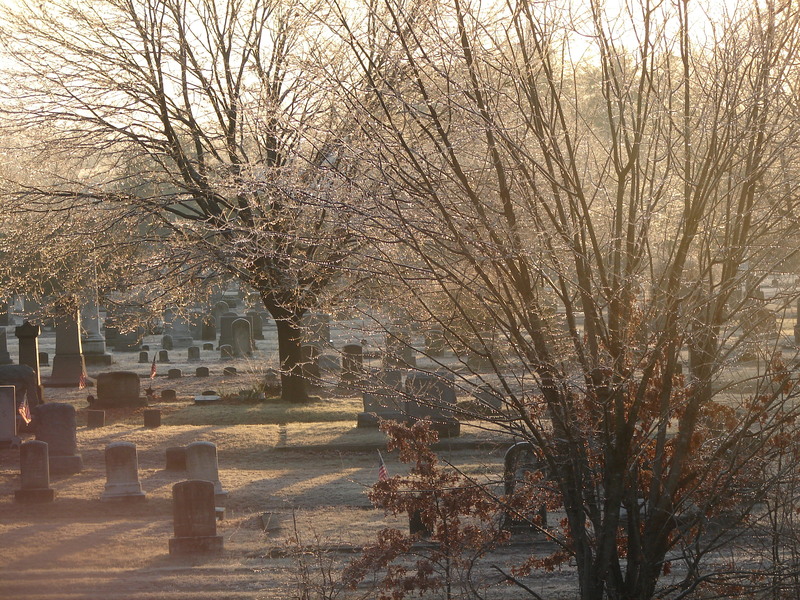 The view is of a simple cemetery, not quite historical, but dated, none-the-less. I don’t mind the cemetery at all. Our house is separated from the cemetery by a stockade fence, a steep slope and railroad tracks that sit down below. These tracks are not for an Amtrak, but for an occasional slow-moving train transferring goods. I take comfort in the fact that know no one will ever build over there, and as neighbors to us, they never make a fuss. The geese fly low overhead and it is very peaceful. The view to me is comforting, almost like an old friend, now. The same stones greet me every morning when I open up my blinds. Sometimes the view can look rather eerie when there is a low fog rolling in, and then sometimes, it can look overwhelmingly beautiful, like just after a snowstorm. There are times I have been depressed and sat on my bed feeling hopeless about a situation, and then through teary eyes, I’ll glance over at the solemn view, and my mind starts reeling. Someday that will be me, nothing more than a name on a stone. Who will remember me? The things I liked, the friends I knew. The things I’ve done? Will it all have mattered? Did I make a difference? An impression? Then suddenly, my current problem doesn’t seem so important after all. That could be me over there. Those stones sit there everyday and I see no one. Not one visitor. Maybe on a very, rare occasion, I’ll see a lone person sitting on a stone having lunch like they are sitting with an old friend, or a car will sit there and someone may get out and wander. I mostly see joggers and walkers, and the occasional person walking their dog, only to have it relieve itself on a stone. Now. that’s a memory I wish not to have when I am gone. The church in the distance rings out the time at 9:00, 12:00 and 6:00, and I think to myself, how odd that is , especially for those in the cemetery who don’t care about the time anymore. And the stones sit there day after day, alone in the rain…in the snow…surrounded in leaves…and then sometimes, the miniature flags come out, like for Memorial Day. It looks slightly alive for awhile. 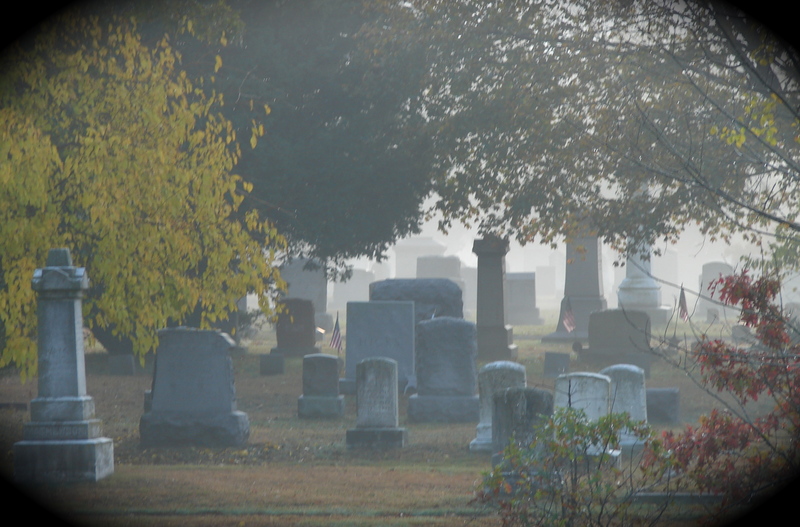 I wonder when the cemetery was first new, how many family members must have come to visit here. Year after year, with flowers and small gifts. I can picture groups of families, probably crying and hanging on to each other. Ill bet it was very busy for a long time… and then it just slowly got forgotten. People got older and passed on, moved away or something. The visiting stops and the stones just sit there and look like they are waiting. Waiting for someone to just remember them. The people there. They were here once, talking and laughing. They had families and memories and pasts. How sad. I don’t want this to be me someday, but I guess it will be inevitable. So, one day, I’ve promised to buy a rose or two. I’ll walk through the plots and read the names and imagine the lives of the ones that lie there. I’ll place a rose on top of a stone, stand back and smile… and maybe, I will even say a prayer. to myself, “No, you are not forgotten…not today”. 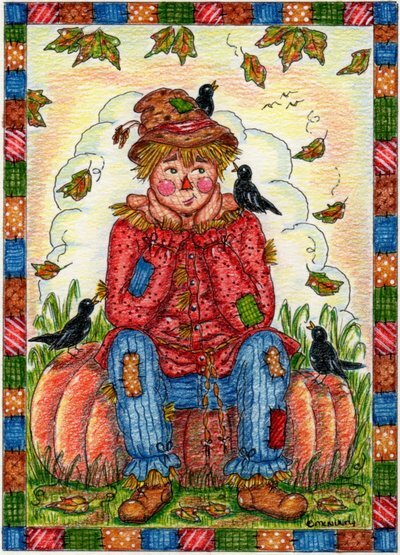 Here Is A Not So Scary Scarecrow! Poor scarecrow! I don’t think he’s quite caught on why he is not scaring those scarecrows away, and I think he just gave up! Maybe it’s because he doesn’t look so scary. Maybe he’s just a little too cute! Oh well, maybe he needed some friends, anyway. Since my married name is McNulty, and my single name was Riley, and today is St. Patrick’s Day….I need to write a blog that has something to do with St. Patrick’s Day, right? 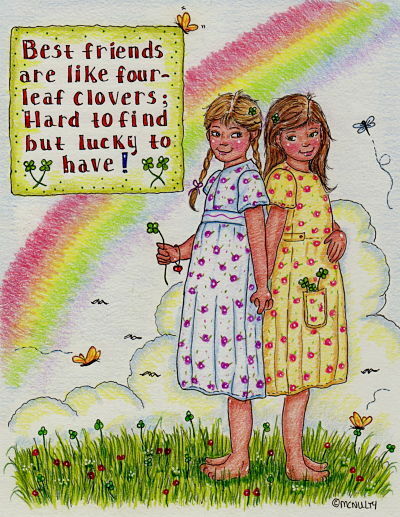 Well, if not only about St. Patrick’s Day, I can write about the illustration here I did awhile back with a quote about four leaf clovers, which I believe totally. Friends are sure hard to find, especially the ones that stick by you. Through the bad times as well as the good. I just know you really need friends, especially when you are younger. I am 50 and I may have one friend, but plenty of family members on my husbands side that I could call my friends. That seems to happen as you get older, friends don’t seem so abundant anymore. Everyone is doing their own thing or live far away. But that’s ok, family is a good substitute. At least they can’t really run out on you. I also have an older sister in my own family that is like my best friend, I wouldn’t change that for anything either. She knows me the best. 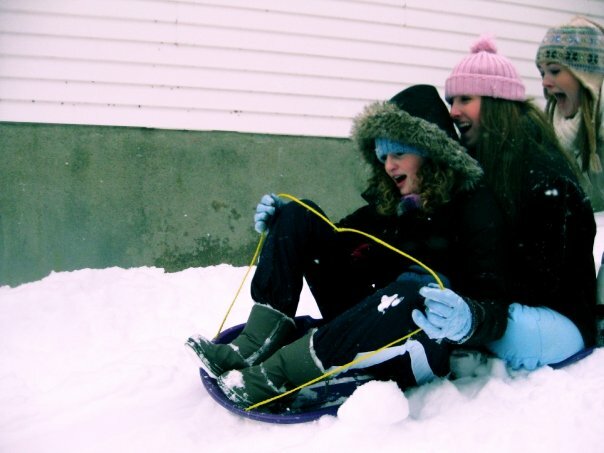 When we were growing up, we shared everything, and that made life seem so much more bearable. Boyfriend troubles, family arguments, money issues, feelings…you name it. All the tough times seem easier to deal with if you have a close friend. My husband is like my best friend, also. I can tell him anything. I would feel lost if I didn’t have my husband to share with. You definitely need someone you can call friend. Someone. Anyone. Even Rover, your dog. I don’t care. If they make you feel better…they’re a friend. In my book anyway. Okay, now getting back to St. Patrick’s Day…who’s having corned beef and cabbage…say “I”. Who’s having irish soda bread…and maybe some drinks :)??? The only part about corned beef and cabbage is finding a decent package of corned beef that doesn’t have a chock full of fat on it and that doesn’t cost something like a gold nugget!!!! Come on…you need to buy 4 of those packages just to make a meal for 4…they shrink when you cook them too, like cotton in the hot wash…holy cow!!! I always panic when I have a table full of people waiting on my corned beef and I take it out of the oven and it looks like the size of a meatball! Talk about cutting your slices thin! Thank God for potatoes and soda bread! Let’s hope your sitting among good friends and loving family members so they don’t make fun of your “tiny” meat. Hopefully they will have few drinks by then..and no one will notice anyway! 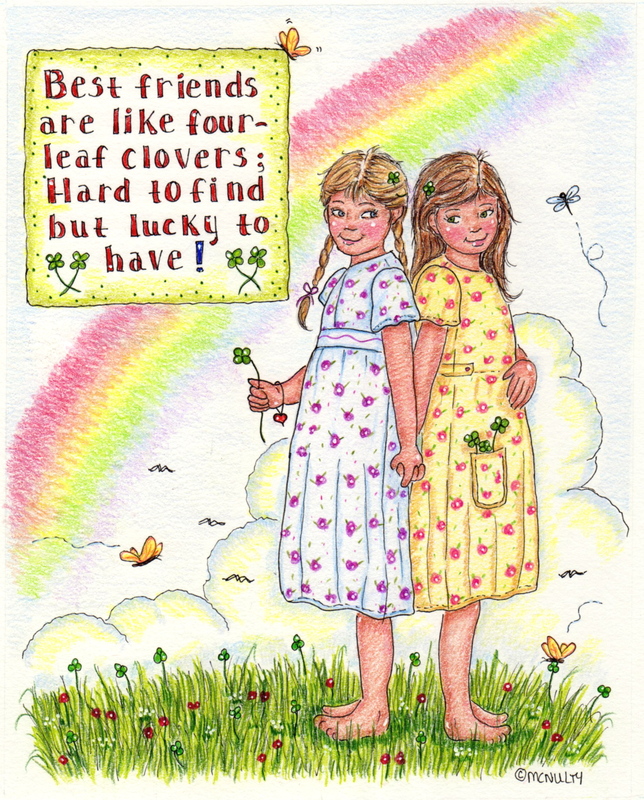 Well, go and have a good St. Patrick’s Day…and think of me at dinner…friend:). (Also, to plug a good movie about the Irish..”.The Devil’s Own ” with Brad Pitt and Harrison Ford. A little violent, but more of an Irish feel. Good story.)Enjoy! There’s a small family of birds that live at least part of the year in the gutter near my bathroom window. On sunny days in the winter, most of the Spring and into the summer, you may hear this incessant chirping going on. You may think this would be pleasant to hear, but when I heard it, it was downright annoying. And all I could think was how they may be ruining the wood to my house and making a mess in my gutters! From that point on, I would try to deter these monsters by rapping a broom handle out my window and right where they would congregate. It would scare them for awhile and provide a little relief. I was even thinking of having them professionally removed…imagine that! Eventually though, they would come back. They always came back. Well, needless to say, the winter in New England this year has been a nasty one. And I must say I have never wanted Spring more badly than this year. I would be happy to just sit in a green house and not move. Just breathe in the sweet air!!! Ahhhhh! There were mounds of snow everywhere and parking was horrendous. Snow blew off cars on highways and blew onto other cars. almost causing very bad accidents. Ahem! I absolutely hated it. I was done. Well, I was getting depressed just thinking how long it would take for Spring to even get here one day as I was getting ready to go out, when there was this one particular day, it just happened to be about 40 degrees and sunny. No wind. I opened my bathroom window and breathed the sweet air and then I heard it! Those birds!!! Those nasty, awful…….I mean wonderful, beautiful birds!!!! 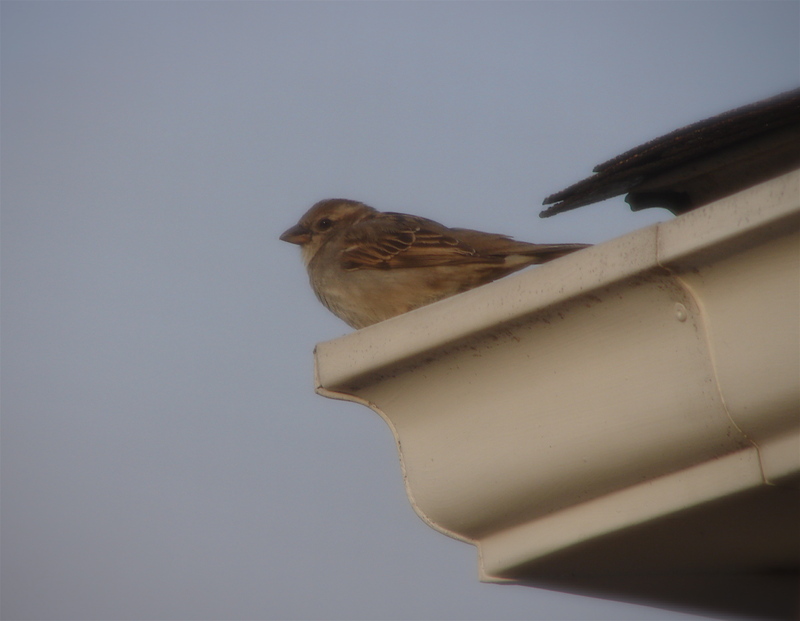 Yes, the family of birds were chirping…and I didn’t even mind! As a matter of fact…I loved it. It sounded just like Spring, and I needed to hear that so badly. It was like music. I would never even think of chasing them away, not a chance. I was even thinking of placing a “Vacancy” sign up just for more birds. You know, I even protected them when a nasty robin or Blue Jay came by to intrude on my “friends” making them very angry and upset. I rapped my broomstick at them and they flew away. So yes, I am keeping my “Feather Friends”, at least for now. I seem to have taken a fancy to them. Maybe I should go out to the store and buy some birdseed, maybe even a birdhouse or two…..hmmmmm. One of my "Feather Friends"
Here is a photo that a friend of my daughters took when they went sledding last year. On the end, and in front are my daughters, and her sister is in the center. I don’t know what it is about this picture, but I can’t stop looking at it. I smile everytime I look at it because of my daughter’s face (Caitlin, on the end)! It is perfect! Her little red-button nose and her expression, plus the other’s expressions, make this feel somewhat like a Norman Rockwell painting. 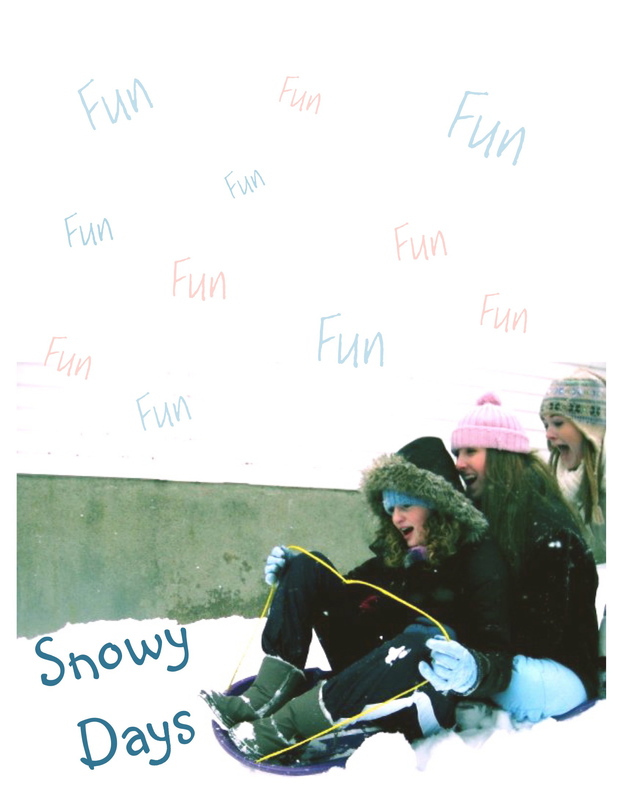 I don’t know if this was planned, but it perfectly depicts the fun of a snowy day. I now have used this photo for everything! As you see here, I have also taken the photo and enlarged it to put under a glass frame and use it as a wipe off memo board. I put the faded words “fun” in two colors, just so it would slightly fill the empty space and it doesn’t clash with the notes I write on the glass. Another great idea from “Real Simple” magazine! I just had to share this. hope it makes you smile, too! Enjoy!